Discussion in 'Schrade Knives Collectors Forum' started by Halfneck, Dec 29, 2010. The Shrade Sharpfinger was one of the 1st fixed blades I remember as a kid. My Grandfather gave it to me to use as my fishing knife. Sadly I put it away wet in the sheath & forgot about it. Ruined it, but I have another now. In talking with most of my friends they almost all had Sharpfingers as a kid. I'm just curious about the history behind such a popular knife. When was it first made, who designed it, etc. Early magazine advertisements for the Schrade Sharpfinger knife, humorous hyperbole when they appeared, have proven themselves prophetically true over time. &#8220;For Small Elephants and Large Squirrels&#8221;&#8230; the Sharpfinger remains an excellent wild game skinner after more than thirty years that few others equal in utility and none excel in my opinion. &#8220;In thirty years you can give it to your grandson&#8221;&#8230; after more than thirty years of near constant field use in camp chores, skinning, dressing and butchering large and small game, waterfowl and fish, I am yet to wear out or break my original Sharpfinger. I have given one to nearly every family member over the years and am yet to have one come back broken or even excessively worn from over sharpening or correct use. My four granddaughters are in line for one when they come of age, whether I survive to that time or not. The Old Timer 152OT Sharpfinger is one of my favorite classic Schrade Old Timer fixed blades. The 152OT was the sixth Old Timer sheath knife when it was first introduced in 1974 and was produced continuously for almost exactly thirty years, nearly a third of a century. It was first manufactured after the Schrade-Walden name had been changed to Schrade Cutlery (in mid 1973), so an example with the Schrade-Walden tang stamp would be a truly rare collectable (though not impossible since factory production records show just over 9,500 pieces shipped by year end and another 2,300 in process!). It did appear in the mid 1973 Schrade Cutlery shortline catalog, even though most research sources state 1974 for the first production. In the 1973 catalog, it was referred to as a "Sharp Finger", later changed to a single word, "Sharpfinger" in 1980, when it listed for $17.95. Interestingly, when the trademark was registered (in 1974) it was two words just as it appeared in the first catalog, and was never re-registered as one word. The knife listed for $37.95 in the 2004 catalog, the last issued before the mid year bankruptcy forced the company's closing and liquidation. With 1973 being only a partial production year, as mentioned above, 9,500 pieces were shipped. 1974 was the first full production year and 36,093 were shipped. In 1975, with advertising and full catalogs, production rose to 69,554 pieces shipped. Production steadily increased from then on; 1976 &#8211; 90,501 plus 11,955 of the new 155SC Scrimshaw version and 14,250 for Peterson Publishing for a year end total of 103,906 pieces of the pattern. 1977 &#8211; 111,512 plus 6,000 Peterson Publishing, plus 232 152SC and 11,397 of the new 155SC totaling 129,141 pieces eclipsing sales of each of the other offered fixed blade knives and all but a few of the pocketknives. 1978 &#8211; 130,499 plus 13,581 155SC totaling 144,080 pieces for that year. The Sharpfinger had firmly established itself as a sales leader. The Sharpfinger has downward curve shaped brown dyed saw-cut textured Delrin handles, referred to by the Schrade trade name of "Genuine Saw Cut Delrin", advertised and guaranteed as unbreakable. I bought one almost as soon as they came on the market and during all of my years of using this knife in hunting and fishing, and also having examined thousands of other used examples, I have never seen one with the handle slabs broken. Melted from campfires or stoves, yes. And deeply scratched or worn nearly smooth by long term use, but never broken. Most noted damage from use, other than blade thinning by overly aggressive sharpening, are missing shields and tipped blades (caused primarily by prying with the thin, pointed tip). In cross section, the handles are generally rectangular with radiused edges. This shape aids the user in maintaining blade orientation, while not being uncomfortable to hold as would the same shape without the rounded corners (as seen on some post-closure copies by other manufacturers). The downward curvature, arched along the spine of the tang is very "ergonomic", though that was not a term in vogue in the early 1970's. It fits the user's palm well. The handle halves are held to the sturdy full exposed tang blade by two flush nickle silver flat head compression rivets, and a 3/4" oblong nickle silver Old Timer shield is set flush on the right handle (rectangular shaped with radiused ends and single stroke letters "OLD TIMER"). On occasion over the span of production, antler jigged Staglon, black, orange, green or cream (ivory) Delrin handles have been used on special and private issues. Jigged bone and Sambar stag, impregnated laminated wood (oak, birdseye maple and walnut) will occasionally be seen as well. The handle has an unlined thong, or "lanyard" hole near the rear and earlier production knives were provided with a leather thong for the user to install. At some time during production, the wrist thong fell out of vogue with users and it was deleted from the package, but the unlined thong hole remained. As an interesting side note, a few enterprising Sharpfinger owners who were also fond of smoking &#8220;hemp&#8221; used the thong hole as a &#8220;roach clip&#8221; to hold their &#8220;cigarettes&#8221; and some examples will be found today with otherwise unexplainable burn marks around the holes in the handle! (Don&#8217;t ask me how I know this obscure trivia). I am sure that this is one creative use for the Sharpfinger which Uncle Henry never envisioned! A prominent choil on the ricasso in front of the handle acts as a lower guard and protects the fingers from the sharpened blade. While it is not as prominent as the extended choil of the 15OT predecessor, it is smoothly radiused on the handle side to form a rest for the user's index finger in normal use grip, or the thumb with the knife rotated 90 degrees for skinning strokes. A raised thumb rest on the top of the tang aids in blade control for finer work. Unlike the grooved feature of the 15OT, the thumb rest of the Sharpfinger is smooth. These two features, as well as the blade sweep, are modifications of the Sharpfinger's much larger ancestor, the 15OT "Deerslayer" introduced in 1964. The 3 1/2" full tang blade is flat ground 1095 carbon steel in it's original design. A stiff blade, the blade stock is approximately 5/32" thick. Often described as a modified skinner, the blade has a pronounced skinner belly with a sharp, upswept tip, and just a hint of a false edge on the upper spine. Overall length was listed as 7 1/4" and weight 4.1 oz. I have found three basic sheath designs so far. One was used beginning with the introduction where the keeper strap originated inside the left side of the sheath and wrapped over the choil to the male portion of the snap mounted on the center of the sheath face. The first sheaths had a pointed end to the keeper straps, then a rounded end. The blade tended to cut this strap inside the sheath when inserted or withdrawn by the user, and at least one former employee has commented that this sheath style resulted in complaints of lost knives due to the strap coming unsnapped. This may be the least common sheath, though by no means rare. After the first few years the sheath was redesigned (sometime in the early to mid-eighties) with the keeper strap moved up to the handle. This pattern is most common and was used until the end of production in 2004. The strap was fed through two slots diecut into the belt hanger above the sheath throat, and riveted to it. Sheaths of this type may be seen with the top closure snap portion either left or right. Perhaps this is an unintentional artifact of the right or left-handedness of the sheath assembler. With the later sheaths, left-handedness became much more consistent, as was the case with most of the manufacturing details at Schrade with the use of more automation and compliance to QS and ISO standards. Sheath finish color varied over the years from light tan, light russet, dark russet, to true brown. Occasionally an undyed replacement sheath shows up on the market. A few special and private issue sheaths are dyed black, usually with white stitching, and a few have appeared with exotic finish textures. All sheaths had a formed front panel stitched with brown or black thread to a flat back panel, with two small rivets finishing the stitching at the throat. The back panel extended upward above the front piece and folded backward to form the integral belt hanger loop. Because of the small size of the 152OT sheath, none were made with the stone pocket found on other Schrade fixed blade patterns. There were stamped &#8220;tooled&#8221; border lines on the integral belt hanger and around the sheath border outside the stitching on the earlier sheath design. Some of the later ones deleted this simple decorative detail. I should mention that a third design, a pouch style sheath with no keeper strap was used briefly beginning in 1983 on production and some limited edition knives and was also available as a separate accessory sheath, the SAS17. As with many other Old Timers, there are some small, relatively minor engineering changes on the 152OT over the years, but most are negligible, and not evident without using accurate measuring devices. One notable change was in the grind which went from plain (flat) grind to hollow grind when the blade steel was changed from the traditional 1095 carbon steel to stainless late in production. No distinctly different tang stamps have been noted so far on standard production knives, other than those a byproduct of worn stamping dies, or in the case of limited editions, special private issues, and the relics appearing from the Schrade sample room. Earliest production was marked with the right-hand tang stamp "SCHRADE" over "U.S.A. 152" perpendicular to the blade and read from the handle. This tang stamp remained unchanged throughout the years of production. While the larger 15OT and many other Old Timer patterns utilized the "OT" suffix on their tang stamps, the 152OT followed the precedent of the 165OT and left the "OT" identifier off the tang stamp. The earlier Walden 15OT's and 165OT's were serialialized on the left tang perpendicular to the blade, but I have never seen a production Sharpfinger serialized, excepting a few limited editions. The only difference I have found in the tang stamps is in minor lettering style changes of the digits. The first knives had full serifs in the &#8220;1&#8221;, then no serifs ( top and bottom), then half serifs ( top only). Evidence via dated SFOs suggests that the first style tang stamps were used at least through 1988. The success of the 152OT inspired Schrade to issue a stainless Uncle Henry Signature version of the knife in 1982, the 152UH "Wolverine", sporting a Staglon handle (Delrin molded and accent colored to imitate stag antler) with the Uncle Henry signature &#8220;bomb&#8221; shield as found on the Signature Series pocketknives, and two flat rivets, all in nickle silver. This was a handle design first used on the 165UH during the short two year first production run in 1969-'70 and repeated on a second later production in 1994-'97. The 152UH was supplied with the standard sheath. It's tang stamp is "SCHRADE+" over "U.S.A. 152UH" on the 440A stainless blade as one might expect. One of the very earliest special limited edition Sharpfingers was the &#8220;Granddad&#8217;s Sharp Finger&#8221; of 1975. The base knife was dressed up with black sawcut Delrin handles, brass rivets, a coined brass empire shield and special blade etch, was serialized and came with a dark brown sheath in a flocked lined hinge top leatherette gift box. MSRP was $25.00 with records indicating 9,216 pieces sold. A second early limited edition use of the pattern was the first Scrimshaw fixed blade, the 152SC (tang mark was simply &#8220;152&#8221 in 1975-76 depicting a broaching whale and whalers with a harpoon on the &#8220;simulated whale&#8217;s tooth&#8221; ivory Delrin handle, a whaling ship on the reverse. It came in a special slip top box with an embossed faux &#8220;elephant hide&#8221; textured black leather sheath. This first issue was followed by subsequent issues sold both singly and sets with new artwork most years (not all) until 1999. After 1999, most of the Scrimshaw knives depicting wildlife repeated earlier used artwork designs, thus it is nearly impossible to determine the year of production unless accompanied by the original packaging and paperwork. Even then, one must be familiar with copyright dates and trademark changes. These knives were the brainchild of Schrade artist Frank Giorgianni who presented the idea to Henry Baer. It proved to be a very successful series for many years. Most of his designs will bear his tiny, almost hidden initials "FG" and the year of the artwork, often the year preceeding the release date. When Mr. Giorgianni retired, subsequent pieces were designed by his sucessor and will sometimes bear his initials or signature. The Scrimshaw art for the 1977 Sharpfinger pattern (155SC) was an eagle with a banner proclaiming &#8220;LIBERTY&#8221; and &#8220;JUSTICE&#8221; on the mark side and a drawing of the ship &#8220;MAYFLOWER&#8221; on the reverse.. The Scrimshaw art for the 1978 Sharpfinger pattern (155SC) was a brown bear walking left to right. The artwork on the reverse side was deleted and replaced by a small panel for the owner's initials. There was no Scrimshaw art for the 1979 Sharpfinger pattern (502SC) as it was replaced temporarily with the SC501 drop point 145 pattern. The scrimshaw art for the 1980 Sharpfinger pattern (502SC) was a bust of a pronghorn antelope. The scrimshaw art for the 1981 Sharpfinger pattern (502SC) was a ram. The scrimshaw art began to be recycled from earlier designs. The Scrimshaw Sharpfingers were also made as SFOs for K-Mart and other retailers on occasion. Often, in order to make them unique for the customer, the artwork was &#8220;mirrored&#8221; and stamped on the left side of the handle and the pattern number was reversed (i.e. 502SC became 205SC). Liberando, Justin.P and weezer919 like this. In 1989-91, Schrade made some Sharpfingers, complete with custom boxes, using stainless blades and tangstamped "SCHRADE+" over "U.S.A. 512OT". Other than the steel and the tang stamp, they were identical to the base 152OT (including the blade grind which changed on the latest knives when they began using stainless blanks). My first personal theory was that these knives were intended as a test marketing of the stainless bladed Old Timer to see if the public would buy it. Subsequent investigation proved that these knives were actually produced for sale in the European market and made in one very limited quantity production run. These are relatively rare. The one I have was purchased circa 1990 in the base tan box with standard 152OT Sharpfinger markings. I have since obtained an original unused box intended for the 512OT Sharpfinger, black with blue and gold printing. While tooled and produced for the sample phase, an sample order of only 25 pieces was shipped to Europe in 1991, and evidently no subsequent orders were placed. The remainder of the just over 2,000 pieces produced (2,156 according to records) were &#8220;salted&#8221; from inventory into the American market over the next few years. 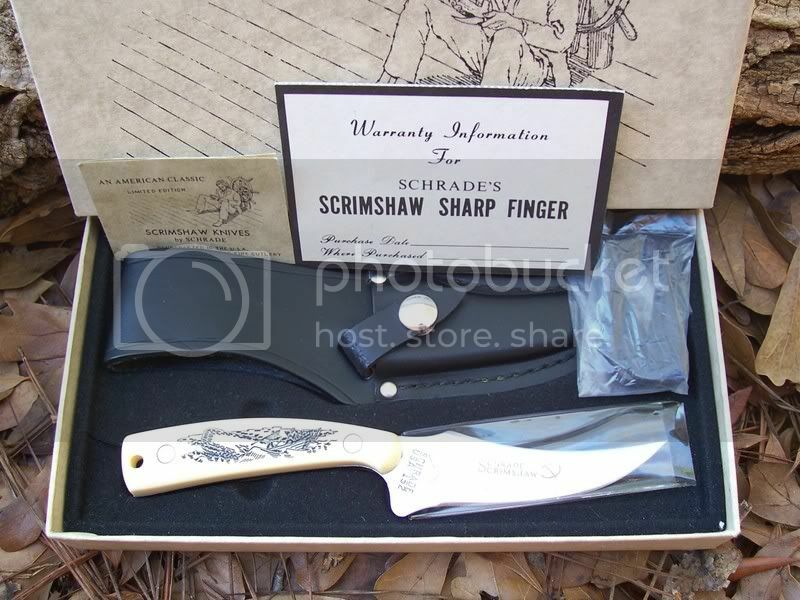 In 1988, Schrade made a small quantity of Sharpfingers for outfitter/retailer L.L. Bean. The order was placed in June of 1988 and 788 were shipped by year's end. If, as suspected, 800 to 850 were ordered, this would make them relatively uncommon today. There is little to distinguish this issue other than a custom stamped "L.L. BEAN" shield in the place of the "Old Timer" shield. Also in 1988, a small quantity of the Sharpfingers were ordered for the National Wild Turkey Federation. They are etched on both sides of the blade and had an additional heat-stamped legend on the handle right, "N.Y.S. Southern Tier Chapter NWTF". Sometime in the late 1990's, Schrade did begin making a running change to stainless blade steel on the Sharpfinger, though the tang stamps and packaging was not changed to inform buyers. I have also one of these stainless 152OT's, one of the last stocked by a local Wal-Mart. Interestingly, the Sharpfinger was listed in the catalogs as "high carbon steel" until the 2004 catalog when the description was dropped from the listing. Limited editions and a lot of private issue Schrade knives had a right side tang stamp of "SCHRADE+" over "USA LTD.", and used a 440 stainless blade. These editions sometimes sported the upgrade Uncle Henry Staglon Delrin handle, brass flat rivets, special etches, and on the later issues, laser cutouts in the blade just in front of the tang. One late Ducks Unlimited edition has a brass DU oval coined shield and brass rivets, and DU laser cutout on the blade ahead of the ricasso. The last production SDU152 in the 2004 catalog had a light oak handle. The 2002 catalog lists a DS15 Federal Duck Stamp 15th Anniversary Edition Sharpfinger. It is shown in a custom walnut presentation box and included a money clip, had green pickbone handles, a flying duck laser cutout in the satin finished stainless blade. With a listed retail of $150, I doubt too many were sold. I have a factory unfinished blank of this model and the tang stamp is "SCHRADE+" over "U.S.A. LTD." The 2003 catalog lists a DS16 Federal Duck Stamp 16th Anniversary Edition Sharpfinger. It is shown in a custom walnut gift box and included a money clip, had bone handles, a flying duck laser cutout in the blade. A private issue with special markings was made for Cotter Company (Tru-Value Hardware) in 1989-90. The tang reads "MM152" over "U.S.A.", and the shield imprint is "Master Mechanic". Factory records show an order for *** pieces placed in 1989 only. I have an example of this issue in my collection and have seen only a very few other examples. Factory correspondence indicates that the knives were assembled at Camillus from components from Ellenville. And yet, other than by knowing the story of this particular issue, I can not tell a difference at this point in examples of regular Schrade Sharpfingers assembled at Ellenville and Camillus. In 1991 a small quantity was ordered with only the Master Mechanic blade etch. Another of the earlier special editions was the 1988 catalog offering of the 152OT in a gift set, SGS-1. It included a sheath and a 34OT "Middleman" stockman knife. This set must have been a good seller, as it was listed in every year's catalog through 2000. The knives themselves are identical to regular production pieces. The set came in a brown leatherette slip top box with a blue flocked insert tray. Occasionally a set will be see with burgundy tray, an SFO made for J.C. Penny, VFW and also used on a Ducks Unlimited set. Beginning in 1976, Schrade produced the 152 pattern knives with cream Delrin handles and die imprinted with inked scrimshaw art, done first by Frank Georgiani, their in-house artist. Every year for quite a few years, one or more designs were released. Most years the 152 scrimshaws were available in a set of seven or more different pattern knives, though many were sold individually. Listing the various different scrims would be a daunting task, and one I will not attempt here. These limited edition knives were usually given unique tang stamps with either a prefix or suffix of "SC". Some I have noted are: 155SC, 205SC, and 502SC with the latter being most used. One special issue is the 152OTO knife with hunter orange Delrin handle and "LIMITED EDITION" shield. 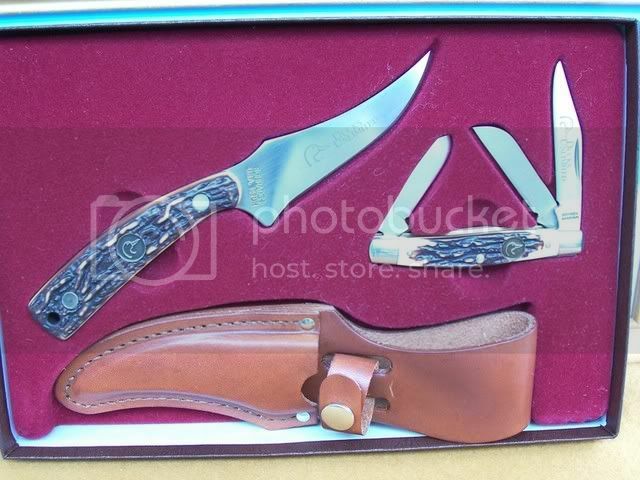 It was commissioned by Smokey Mountain Knife Works circa 1991 for inclusion in their "father and son" hunting sets with the 165OTO "DEERHUNTER", 15OTO "LIMITED EDITION", and 158OTO with an Old Timer shield. Quite a number of these appeared for sale after the Schrade closing, so they are unique, but not really rare. 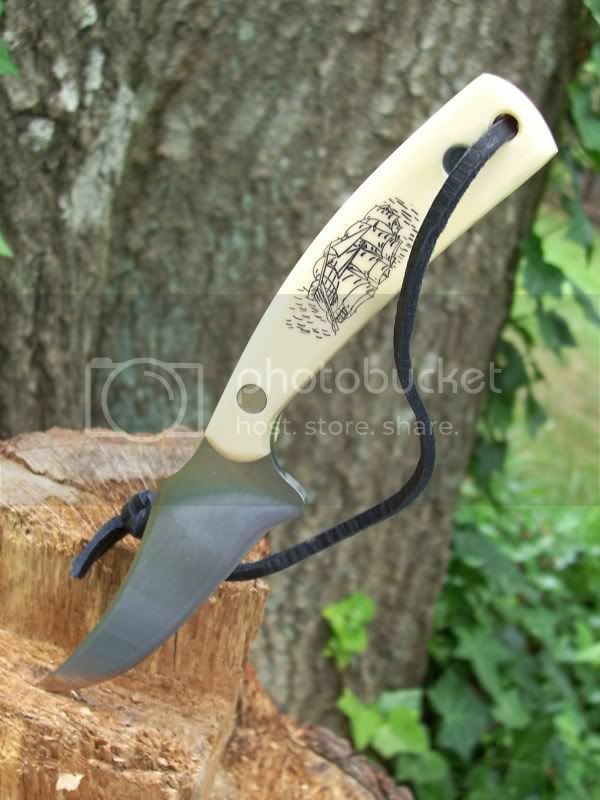 The Sharpfinger &#8220;Scrimshaw&#8221; knife was selected for a fund raising promotion for the U.S. Shooting Team at the 1984 Summer Olympics held in Los Angeles, California. The ivory Delrin handle sported the red and blue Olympic Shooting Team logo and the blade had a special etch commemorating the games. These serial numbered knives were ordered in two grades, the first serial numbers with gold filled etching for presentation to sponsors and officials and the others with higher serial numbers had standard etching and were sold mail order from Westwind Productions and at the Shooting booth at the games in Los Angeles. Both came in a special presentation box with a certificate. The 152 pattern was used by Peterson Publishing in 1976-77, along with the 154 pattern, for promotion of two-year subscriptions. Shields on the black sawcut Delrin handles were stamped with the magazine names, "Guns & Ammo" on the Sharpfinger, and "Hunting" on the Drop Point Hunter. I&#8217;ve not seen both patterns with both stampings. They used the production 1095HC blade blanks and custom "SCHRADE over U.S.A." tang stamps. As an interesting aside, after years of searching, I finally acquired an example of this knife in it's original shipping box from Peterson. It contained a SAS17 pouch sheath and the box was post marked 1983. So did Peterson order remainders in 1983 when their supply of 1983 promo knives (a different brand) was used up, but obligations were still outstanding to subscribers? A sample emerged from the sample room after the Ellenville factory closing and sale with laminated wood handle and stainless blade with LTD tang stamp, no shield. I have the 165OT example of that model, and have seen a matching 15OT pattern. Another pair of these unreleased samples had blue Delrin on one and red Delrin on the other. A few black Delrin sample knives scrimshawed with white even emerged. Several 152 pattern knives came from the sample room with a tang stamp "New York-Walden- Knife CO.", and custom burnt stag handles, a blank fancy nickle silver shield. These were remainders of a production previously done for SMKW under license from the then owner of that nostalgia mark. 152BEM was made with birdseye maple handles for the 100th Anniversary issue in 2004. They had the banner blade etch and a coined anniversary medalian shield. Very few were completed before the company closed. Also for 2004, the Ducks Unlimited SDU152 had oak handles and a coined DU shield. First introduced circa 1984, several clampack designs were used over the years. One was with a black topped green card with yellow burst design on bottom right describing the bonus enclosed knife care kit (SK3). Another used an all green card with a black center band, a yellow burst design in the upper left corner describing the bonus enclosed "Arkansas Sharpening Stone". Enclosed cardboard clampack art design and logos in regular production clampacks mimicked the artwork of the then-current pasteboard boxes; tan, blue striped, and then blue and gray. Several American companies have, since July of 2004, tooled up and begun producing their own versions of the Sharpfinger. None are trying to make exact copies excepting TBLLC. Some come close to the original design in appearance and function, and some even add their own detail improvements. Since a design patent on the Sharpfinger was never filed, the design is in the public domain and no license fee is required for any maker to use the pattern under their own tang stamp and trademark name. Camillus of New York was one of the first with their "Gran'Pa&#8221; &#8220;Sharp Hunter GP152" version ( this effort was short-lived as Camillus also bankrupted and closed in 2007). Mr. Tom Williams, former Camillus employee and historian, has stated that his company did do assembly work of the Sharpfingers for Schrade. This is confirmed in internal Schrade memos which discuss sending quantities of components to Camillus for assembly of the MM152 knives for Cottr/Tru-Value in 1989-91. Mr Williams stated that they had the left-over tooling for them, thus Camillus, after the Schrade closing, began producing their own versions of some Old Timer patterns including the Sharpfinger, the &#8220;Gran&#8217;Pa&#8221; series. There are some marked differences in the Camillus produced and branded knife and the regular pre-closing Schrade Sharpfinger. The Camillus &#8220;Gran&#8217;Pa GP152&#8221; knife has a flatter grind, a vertical Scotchbrite finish, slightly domed rivet heads, an oval &#8220;GRAN&#8217;PA&#8221; shield, slightly different handle slab mold, longer thumb rest and a more squared choil on the blade blank suggesting an entirely new blanking die as well as handle mold. The sheaths are identical, possibly old stock or from the same supplier as previously used to supply them to Schrade. While an observant and knowledgeable collector shouldn&#8217;t confuse the two knives, I find the Camillus version to be quite well made and not out of place at all in my collection of Schrade Sharpfingers. 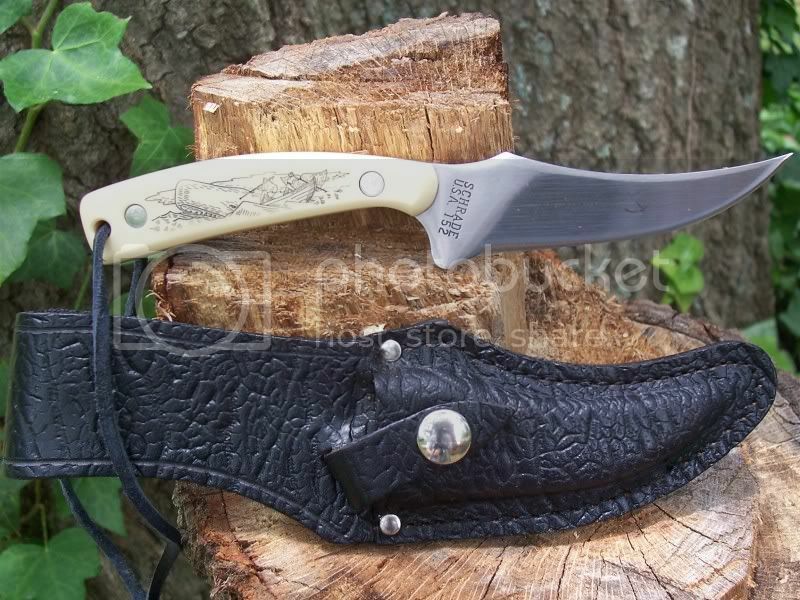 Next was Arrowhead Cutlery of Tennessee (manufacturing division of United Cutlery Brands which subsequently bankrupted and closed) with three versions, the "Rigid Max Edge Bear Foot Hunter RG0152MX", the "Rigid Bear Tooth Hunter RG0152", and "Outdoor Life Small Fixed Blade Hunter FS0152C". I have an example of this last knife and I consider it&#8217;s fit and finish to be good, though the solid brown Delrin handle isn&#8217;t as &#8220;handsome&#8221; as the two-toned Schrades in my opinion. It has a stainless blade with a &#8220;frosted&#8221; finish, near perfect grind lines (hollow ground as were the last Schrade produced Sharpfingers). And finally, Bear And Son Cutlery, Inc., of Jacksonville Alabama (formerly Bear MGC) has made the "Upswept Palm Skinner BC253R". I look for other surviving U.S. cutleries to make their own versions at some point if they have not already. Some cheap imports made in India, Pakistan, China and various other Pacific Rim countries will also be occasionally found such as the &#8220;Winchester&#8221; branded example I bought at a flea market some time back. A black coated, black plastic handled &#8220;knockoff&#8221; of the 152OTX which Schrade prototyped for (and was rejected by) Wal-Mart, it was imported by Carolina Knife & Tool of Portland Oregon. A very cheaply made knife, the best part of it was the included black &#8220;cordura&#8221; sheath. The Pakastani copy (also a flea market find) bears no markings but &#8220;Pakistan&#8221; on the thin stainless blade. Handle material is what one has come to expect on such a cheap import, multicolored laminated wood (think Christmas tree) and the sheath is of very thinly split leather held together with plastic gymp lacing rather than stitching. Overall quality? The Chinese Winchester from CK&T is twice the quality which is in itself half the quality of even the China copy first imported by TBLLC in 2005. Still, I gave less than the price of a beer for the two of them, new in the box. In the interest of aiding collectors in identifying correct Imperial Schrade produced Sharpfingers, mention must be made of the imported "New Generation" knives from Taylor Brands LLC., purchaser of the Schrade trademarks and patents. These knives of the 152OT pattern appeared on the market in 2005, less than a year after the bankruptcy liquidation sale of Imperial Schrade assets at the factory in Ellenville. I will attempt here to point out the obvious differences of those first imports to the collector, so that one will not be confused with the Imperial Schrade production. Taylor Brands LLC. (formerly Taylor Cutlery) is an importer and wholesaler of knives, and now a licenser of the Schrade trademarks to some American cutlery manufacturers, and not a manufacturer themselves. I bought one of the first imports on the internet unintentionally. The importer had packaged these first knives in clampacks with artwork almost identical to the last produced Imperial Schrade knives right down to the American flag. The Taylor 152OT knives were contracted to a cutlery factory in China (and I assume still are). This example of the knife is stainless (no "+" mark). The tang stamps are "SCHRADE" in large text on the right aligned with the front of the handle and angled to the blade, and "152OT" on the obverse with the same alignment. Neither the importer's name, nor the country of origin is stamped on the knives themselves, but these first ones imported bear a left hand etch of the Taylor/Schrade Logo with the words "SCHRADE" over "CHINA '05", along with right blade Schrade Super Sharp. Some which I saw at that time were etched "First Production Run". The originals, as far as I have seen, do not have either of these etches. The "sawcut" of the scales has a different appearance, more so under magnification. On the U.S. Schrade, the grooves are wider than the lands. On the imported knife, the grooves are narrower than the lands and there are more lines per inch. The handle edge radius seems to be sharper than the Imperial Schrades. The rivet heads appear to be machine spun, not polished as on the U.S.A. produced knives. The Taylor "Old Timer" shield is of the rope border style that I have not seen used on the original 152OT from Schrade. Flash, tiny scraps of excess plastic appear around the rivets and the shield cavity indicating lack of finish quality. The shield on this early example has a rope border possibly adapted from some earlier genuine Schrade issues. The Taylor sheath is made from the pattern of the standard Schrade Cutlery tan leather second design sheath with the keeper strap riveted to the belt hanger, and no rivets, whereas the U.S. has two small rivets finishing the stitching at the top of the sheath throat. The only other distinguishing feature I have found so far seems to be a slicker finish on the surface of what appears to be a lesser quality material, probably reconstituted leather made by compressing shredded leather fibers with a binder substance. While the last MSRP on the Schrade Cutlery 152OT was $37.95 in 2004, the MSRP for the Taylor 152OT in 2005 was $24.00. With a bit of searching, a prospective buyer could purchase one for 2/3 to 1/2 of that price. As mentioned, it came in a clampack resembling an original Imperial Schrade with a gray stripe on the left side and an American flag on the left top panel. The bottom right of the card panel was marked with the "Schrade Tough" logo and "Taylor Brands LLC." I expect that these details on the first production TBLLC knives have changed in the almost five years since I obtained my example for comparison. Likewise, I would be surprised if the quality of fit and finish has not improved since these first efforts. The Sharpfinger knife pattern was so popular for such a long time that hundreds of thousands (if not into the millions) were produced from the introduction to the cessation of production, both as basic 152OT Old Timer issues and variants. As smaller blades became the rule of the day with new generations of outdoorsmen, the Sharpfinger gained in popularity, and became one of the few successful crossover fixed blades sold by Schrade, finding buyers among store clerks, grocery stockers, artists and craftsmen, and even self defense gurus. And as sales, i.e., profits sagged on the large hunting knives and they were dropped from production piecemeal, the 152 soldiered on. That the 152OT survived basically unchanged from its introduction as a production knife as long as it did is a testament to the purity of utility in Henry's original design. Quite a few fixed patterns were tried and discarded during the diminutive Sharpfinger's production of thirty or more years. The much larger 15OT Deerslayer found a loyal following among the "G.I." generation, and then the "Baby Boomers" that came to the knife buying market behind them. And Imperial Schrade prospered in this marketing period. As the older generations of buyers began being replaced by younger buyers, large knives preferred by their fathers and grandfathers for hunting and camping the old way fell out of fashion. More stringent enforcement of knife laws is another reason. In this state and many others, carrying a knife with a six inch blade is frowned upon , if not outright forbidden. This, I believe, is one of the main reasons that for the last years of Schrade's production of this knife pattern, it was purchased to be used as intended - as a tool (although by Schrade's own admission, they never envisioned it's popularity among non-outdoorsmen). Given the shear number of units produced over such an extended time period, and the continuing glut of NOS knives out there, the manufacturers of the new versions will have a chore ahead of them to capture a meaningful share of the increasingly saturated market for Henry Baer's Sharpfinger pattern skinner. Some of these have already dropped from production and become themselves modern rarities, though not yet deemed by most to be collectable. They do help to complete the historical picture of the pattern for the dedicated Sharpfinger pattern collector, however. The search for a design predecessor to the Sharpfinger has proven indefinite. No direct ancestor can be confirmed at this point. However, as it does resemble the much larger 15OT Deerslayer in several of its features, that knife is almost definitely in its family tree as Henry Baers inspiration. A much earlier pattern which strongly suggests the size and features, though in different proportions, is the Fishing knife first produced by Marbles in the early 1900s and quickly copied by Adolph Kastor & Brothers / Camillus in Europe (Oligs-Solingen Germany and Miksolvik Austria/Chezcoslovakia) with the A.W. Wadsworth, Wadsworth & Son and W.H. Morley- tang markings for sale in the U.S.. It has the same blade shape though much taller at the tang with a deeper belly. Other than the general size and shape, what suggests to me that this knife pattern is a predecessor of the Sharpfinger is that Albert Baer handled and sold these knives while working for Adolph Kastor and his sons Alfred and Robert at Camillus prior to his buying Ulster, Schrade and his association with Imperial. the Schrade Sharpfinger were few, but do bear mentioning here. The first was the 154OT Drop Point Hunter introduced in 1976. It used the same handle shape as the 152OT (perhaps even shared those common components), but has a downward pointed blade following the curve of the handle. It was discontinued after 1988, but was used for a few SFOs and limited editionssuch as a few Scrimshaws (501SC), U.S. Tobaccos Skoal/Copenhagen issues and the Peterson Publishing promotion (Hunting magazine shield). An Uncle Henry version, 154UH Badger was offered in 1994-97. Then in 1988 when the 154OT was going to be discontinued, another child of the Sharpfinger was introduced, the 158OT Guthook Skinner, basically a 154OT with a guthook added on the upper spine near the tip with a sharpened rear facing sharpened slot. The 158OT continued in production until 2004. It was also used for a few Scrimshaw issues (518SC) and as a SFO and limited edition. The Sharpfinger pattern even crossed over to the Imperial Frontier line with the slightly longer 412 pattern, itself used as a Scrimshaw on occasion. The 412 itself became a Scrimshaw SFO for Parker Frost. My interest in these knives, though made by a company relegated for the time being to history (and continuing only as a nostalgia marking on imported knives) began more than thirty years ago when I purchased a 165OT Woodsman for my hunting and camping adventures, and then the 152OT Sharpfinger, the small skinner companion to the larger fixed blade, which became perhaps THE best seller Schrade fixed pattern, this one even among people who did not spend a lot of time outdoors. Describing exactly why I find this knife so handy for many uses is difficult. The size allows it to be belt-carried without getting in the way so that neither by weight or length does it constantly remind its owner of its presence. In this regard, it is much like a small pocketknife. The handle shape lends itself well to a variety of different holds depending on the task at hand, always allowing a user familiar with its shape and feel to index the blade correctly, unlike many larger knives with symmetrical handles. In skinning and butchering game animals and fish, the short blade allows piercing of hides while the belly works well for the slicing strokes useful in skinning and separating flesh from bone. The little 152OT knife is still a favorite of many "old timer" outdoorsmen, hunters of large and small game and fishermen, yours truly included. Amazing post as usual Codger. Glad to see you online again. I hope the New Year brings peace and healing to you and your family. it is so nice to see Codger back to educating us poor unenligthened collectore. thanks for all your knowledge, time and not the least great writing style. glad to see you back and please accept my most humblest best wishes on your coming new year! Thanks guys. I cannot help but be an optimist. And as far as the writing, when I posted this latest piece I saw several places in it that needed updating and corrections. I'll get a round tuit soon, I hope. For whatever it is that needs optimism in your life--I hope the best for you. I worked at the local hardware store while in college in the late 70s. They sold Sharpfingers and I bought one mainly to use at work. I wore it at work and at school for the next few years--it was my EDC. It's hard to imagine openly wearing a fixed blade on that college campus these days. Anyway, I have great fondness for the knife and still carry and use one on occassion. In fact, over the past year or so I've gotten back into EDCing small fixed blades, and this is a direct result of my positive experiences carrying the Sharpfinger as a young man. The Sharpfinger found a much wider market than Uncle Henry Baer had ever envisioned. Stock clerks loved it for opening boxes and many people just found the size to be very handy and unobtrusive, allowing EDC and special purpose carry when other, larger fixed blades were just too much. Fishermen seated in boats and other outdoorsmen driving to and from their fields found the short length didn't require them to remove it from their belts like longer sheath knives. The length also helped in that it complied with many blade length restrictions. And... the little blade, intended for skinning game and fish, seems to work all out of proportion to it's diminuitive size. It is just plain handy without getting in the way. No wonder they sold so well for so long. And no wonder other makers are now trying to get a piece of that market. But there are still plenty of originals out there in new condition to choose from. I have bought a small variety of the "me-too" knives just to compare with the real deal. The Camillus "Grand-Pa" is the closest, IMHO. Unfortunately Camillus (sister company to Schrade) also tanked in 2007. I predict that the pattern will remain popular for quite some time yet. A Sharpfinger was the first fixed blade I ever bought back in 1980 at the KMART in Menominee Michigan. I still have it, money well spent. I'll bet if you toured the UP today Phi Sig, and checked out all of the old hardware and sporting goods stores, you might still find some Schrade USA knives. It would be a fun tour too. I spent one fall in Escanaba, and the UP is a wonderful part of the country. Codger_64 - Thank you very much. I received a lot more information than I expected - Outstanding. Now not covered in Codger_64's excellent information - How many Sharpfinger owners here shoved the tip of the knife through the sheath while re-sheathing it? Possibly stabbing themselves too? I know I am guilty. When my close friend showed me his Sharpfinger from childhood I checked the back of the sheath & sure enough there was a small slit. True. And how many people punched their thigh with that sharp finger when the tip went through the sheath. Amazing how much that can bleed. Or how certain persons of the hippy persuasion used the thong hole as a roach clip. Or that Fred Perin espoused the pattern as a self defense weapon. And Sonny Barger (Hell's Angels) used a bloody sharpfinger on the cover of one of his books, "Dead in five heartbeats". Also not mentioned was the reason for the first sheath change. Early buyers weren't careful in securing the choil retainer strap resulting in lost knives. So the retainer strap was moved further up the handle. This per Ms. Chase, Schrade Historian. Thanks for the very complete Sharpfinger info, Codger. I don't know what we would do without you. A lot of fine history there Codger, thanks for posting it. I didn't plan on having more than one 152, they just kept turning up. to be easier to do the older I get. I have the Whaler 152 and Mayflower FH. myself with ye olde 'Mayflower'. First whaler I found had a smooth black sheath. Few months later found one with rough black. Thanks, don't think I'll take on that big a 152 project. I do have a GDOT 34 so maybe a GDOT152 would fit in. Then find an empty box w/right cutouts for a GDOT 152/34 gift set! Just noticed the rough black sheathed whaler is missing the blade art. BTW here's the OTO's tu-tone sheath some may not be familiar with. Growing up, my grandparents owned a laundromat. Now many might think of the average laundromat customer as a student-type. But this was a Pacific Northwest small town laundromat. The average customer in the 1980's in said laundromat was a 1970's hippie who had returned to the idea of clean clothing , but still lived without power or running water on some 2.5 acre "piece of paradise". So many, scores of these guys, had sharpfingers on their belts. It is the knife I remember most from my childhood. I just found my old 152 in the basement today while cleanin' up after Hurricane Irene along with an old 158 along side of it, found a lot of wet knives but these two were above the water line.